Eco Discovery Park is Williamsburg’s first Eco-tourism destination. Their mission is to inspire people, organizations, businesses, and government to make the health of our environment a priority in our actions. 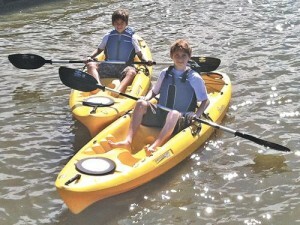 Opening this weekend, April 21, the Eco-Discovery Park is hosting the first James Riverfest, honoring Earth Day. This all-day fest is sponsored by the James River Association. Have you seen the oxen in Colonial Williamsburg? Together, 2 (or more) cattle used to muscle a heavy workload, are called “oxen”. 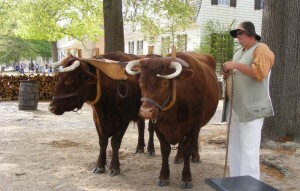 Separately, they are not considered oxen. Oxen can pull heavier loads for longer amounts of time than horses. Horses were usually used just for transportation purposes – single travelers, or horses could carry more of a load of people with carriages.